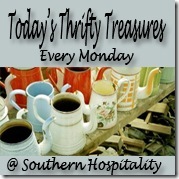 It’s another week of thrifty treasures and here are a few of the highlights from last week. Nostalgia and cookie jars! Nothin’ better. The Blest Nest was cleaning out her mom’s house and found this pretty old jar. I don’t blame her for keeping it either. The Hill Hangout scored this nifty old dresser from the thriftstore for $75 and really personalized it with some bright orange paint. Talk about giving it new life, this will do it. I’m loving the new trend of painting old wood with a pop of bright color to infuse some energy into a room. These old 70’s pieces are great candidates for that look! Now here’s an amazing find from Made by Meg! This Maitland-Smith desk (very high-end furniture manufacturer) was found for $300 at a resale shop. What a fine looking desk this is and there is no telling how much it cost retail when it was new. Mary, the Retired Nester, found this chair sitting on the side of the road. Hello! What a beauty she is now with a fresh coat of paint and new fabric. I love these old Empire style chairs. Look what Betsy from Coastal Colors did with that oh-so-cute stool we found thrifting at the I Love Thrifting party a few weeks ago. I love it! She stenciled on the top and painted the legs creamy white. I’m so glad she found a way to keep the top, it really had a nice patina. Check out what Taking a Sunday Drive found at a yardsale for $2! It was plain brown wood, not very appealing, but after painting it a coat of creamy white paint and adding that bright coral fabric, how perfect is it against the teal walls now? Yes, perfection. Selep Imaging collects pretty colorful bottles and this pic just made me smile! Love old bottles and all the colors they come in. For a mere $15, Stacey from Embracing Change scored this beautiful blue dresser in need of a makeover. I’m sure she has big plans for it! There are a TON of parties out there to highlight all your projects, so please let’s keep this one about thrifty finds that were bought 2nd hand! Not a great sale from the store, or a recipe, or just a plain project, but 2nd Hand finds only! And please DO NOT go back in your archives to OLD posts and link up. Let’s keep this party fresh and current! If you have already shared your find in a previous party, DON’T share it again! Please, girls, I don’t want to have to delete links. I’m excited to join in on the party today. There’s always so much to see. since my VINTAGE computer has been giving me grief I have missed getting around. Thank you for sharing the highlights. Thanks for hosting this link party. I love those pretty bottles!! Wow, Rhoda, thanks so much for featuring my treasured cookie jar! I figured something was up when I saw a huge spike in views! I just adore your blog and my man used your builder mirror frame out tutorial in the past couple of months with great success. I love that a woman can teach a man a thing or two! Ha ha! Have a great day! Wow, I Love your blog. Thanks for hosting. I’m new to linky parties. I love seeing what other people create.